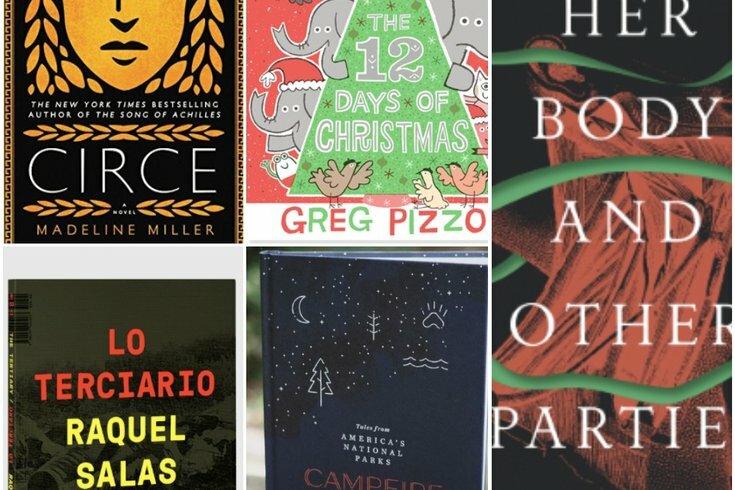 Book covers from Philly-based and native authors. Stumbling upon a local author at the book store gives me a specific kind of thrill. Lately, I've started to more intentionally select and purchase Philly-based or Philly-native authors at local book stores, too. This holiday season I have made it a point to gift my loved ones with not just what I think they want, but really what they need. And I think we all need some great books in our lives. So, I've compiled a list of five Philadelphia authors that I've either read, heard about, or whose books I'm itching to get my hands on. And because I want to help promote some smaller bookstores in the area, I've also included a link to local Philly bookstores where you can pick up copies online or in person. Here is my extremely abridged and completely biased list of five books by Philly authors. Philadelphia's 2018-19 Poet Laureate, Raquel Salas Rivera, marvels with their dual-lingual poetry that examines the Puerto Rican debt crisis and colonialism in a deeply declarative and heart-wrenching collection. I heard Rivera do a reading from this book before it was released; there's a reason it's No. 1 on this list. Here's where you can buy it locally. Carmen Maria Machado is a Philly-transplant that created a lot of buzz with the release of "Her Body and Other Parties." It was a finalist for the National Book Award, nominated for the Kirkus Prize, and printed nine times. Here's a great Q&A with her if you want to learn more. "Her Body and Other Parties" was one of my favorite collections of stories in 2017. If you haven't read it yet, or know someone else who hasn't, get on it people. Oh, and if you like "Her Body" be on the lookout for a future project from Graywolf Press coming in October 2019. Madeline Miller, who attended the Shipley School in Bryn Mawr and lives outside Philadelphia, vividly retells the story of Greek goddess Circe, daughter of sun god Helios, and reimagines her as the superhero that she really is. From Miller's own description: "Circe unwittingly draws the wrath of both men and gods, ultimately finding herself pitted against one of the most terrifying and vengeful of the Olympians." I found this book to be disarming, nostalgic, digestible, and romantic all at once. This anthology of stories, legends, and ballads was collected from six American National Parks by Philly-based creatives David and Ilyssa Kyu. The stories are meant to be read together around a campfire, but I think for holiday purposes, reading next to a fireplace aloud will suffice. It's kind of the definition of campy (ha, get it?). I will admit I have not read this one, but it's on my list. This one is for the kiddos or anyone who is very into Christmas. Pizzoli, a Philly-based author and illustrator, has come up with a lot of really great children's books, but this one is festive and would make a wonderful gift. This silly take on a classic stars an elephant who just keeps getting presents. 12, to be exact. In Pizzoli's words, "And just what are they supposed to do with ten lords a-leaping?"